Notifies the leader that attendance has been entered and new guests added. Provides a link to the most recent Meeting for their Organization. Provides the means (with an interactive list) for leaders to contact their absent members who have missed at least 2 consecutive meetings. 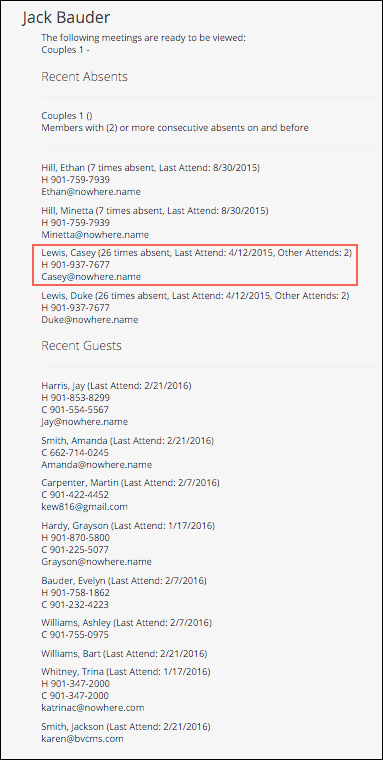 Provides the means (also with an interactive list indicating the guests last visit date) for leaders to contact their recent guests. Someone on staff triggers these notices after all attendance (including new guests) has been entered for a specific set of organizations. Has at least Access role. To clarify about leaders who receive these notices. A lay leader with Access and OrgLeadersOnly would receive these notices if he is a leader in one of the orgs. Also, a staff member with Access with or without any other roles and who is a leader in one of the orgs will receive the emails, too. A My Data user that is a leader will not received these emails. This determines how many consecutive absents an organization member can have before appearing in the Attendance Report. The default is 2, but you can change the absents threshold on the organization. If you haven’t already, please consider giving each of your leaders a user account in TouchPoint with Access and OrgLeadersOnly roles. If you want them to be able to take attendance for their org you can add Attendance role and those leaders can take attendance using the App on his mobile device. If you would like to Preview the Notices before you send them you have that option. Find the organizations for which you want to send the notices. Go to Organizations > Search/Manage from the main menu. Select the Program and Division (Schedule is optional). Click OK when you see the prompt. You can also filter for just one organization by entering its name in the name field. Or you can enter other information in that field to narrow your result to fewer orgs than the entire Division. Select Life Groups (Program) and Students (Division). Enter 10th Grade in the Name field to send to only the 10th Grade classes within the Students Division. Any system user (with at least the user role Access) who is a leader in any class included in the selection will receive this email notice. Also, any leader in a Parent Org for any of these orgs will also receive the notices, if he has at least Access role. The person who triggered the Email Attendance Notices will receive an email with the subject Attendance Emails Sent. The body of the email will contain a list of everyone who was sent a notice along with the name of the class, its location and the date and time of the last meeting. If you prefer for this to be something other than 2 meetings, you can change it on the organization. Go to the organization and the Settings > Attendance tab. Click Edit and enter a number in the Consecutive Absent Threshold field and click Save . The default subject for these emails is “Attendance Reports Ready for Viewing.” However, you can create your own text for the subject of the notices, if you prefer. Your System Admin can do this in the Settings. Add a setting named SubjectAttendanceNotices in Administration > Setup > Settings , and enter the text you want as the subject. Before sending these to your leaders, you can filter for your list of organizations, then select Toolbar > Envelope > Email > Preview Attendance Notices . This will display all the classes in your filter with exactly what will display in the email. Notice in the screenshot below that the list displays the phone number and email address for your absentees and guests. That makes it so easy to contact the person right then. The Absent Members will display first, showing the number of consecutive absences and their last attended date. If the person has attended something else during that time period, you will also see Recent Attends followed by a number. This lets you know that, even though the person did not attend your class, they did attend something. The number will tell you how many times they attended something else when they were absent from your class. Next will be any Recent Guests . The guests will be any guests who would still be on the roll sheet that week, based on the Roll Sheet Guest Weeks setting. They will be in alphabetical order and will have their last attended date.